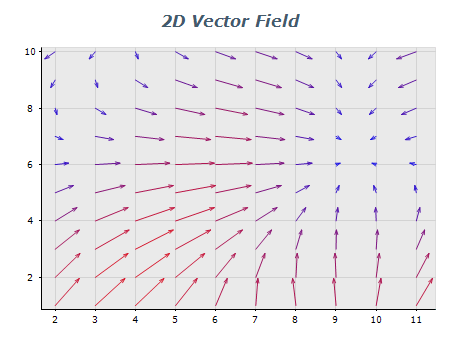 This example demonstrates a 2D Vector Field implemented with the Vector Series. Each arrow represents a data point that is defined by 4 coordinates: Begin X, Begin Y, End X, End Y. This example demonstrates a 3D Vector Field implemented with the Vector Series. Each arrow represents a data point that is defined by 6 coordinates: Begin X, Begin Y, Begin Z, End X, End Y, End Z.